Do not forget important events ! 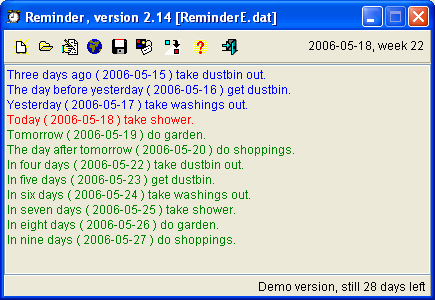 Use Reminder, an event reminder; <br>At every startup of your computer it reminds you (in your own language !) of <br>important events you may not forget. It displays a window with recent <br>events. Only events within a (for every event) adjustable time window will <br>be displayed. It reminds you once a week or once every two weeks or once <br>a month or once every two months, etc., etc. <br>Full Help is available.